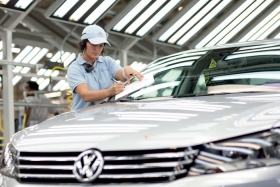 A Passat is inspected at VW's plant in Chattanooga, Tenn. The U.S.-built Passat has features targeted specifically at American consumers. HERNDON, Virginia -- Volkswagen Group of America got the alert less than a month after the redesigned Jetta sedan went on sale last September: First respondents to the J.D. Power and Associates Initial Quality Study complained about excessive wind noise. That came as a surprise to Marc Trahan, 57, who had just joined VW as its quality guru from Audi of America. "It was one of the most frustrating problems I've had," he says. "You would not expect that in this day and age." Trahan's VW job is similar to one he held at Audi. The former dealership service technician is responsible for helping the VW brand bolster quality. It's a key job. As VW aims for a sharp increase in its U.S. sales, its spotty quality reputation remains a major hurdle. Improving the brand's generally poor showing in the widely followed Power Initial Quality Study, in particular, remains a challenge. And it plays out in showrooms: One dealer says that competing brands point out VW's poor quality ratings to customers cross-shopping VW. In the case of the Jetta wind noise, VW followed up the monthly J.D. Power report by tracking the problem and found fewer than 50 complaints. Armed with vehicle identification numbers, VW quality specialists went to the homes of 12 Jetta owners from October to February who complained and drove and inspected their cars. By February, Trahan knew the two things that were causing the noise: a gap in the mirror housing and door seals that were too narrow. 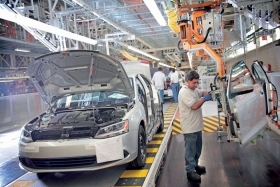 Some of the problems were caused in production, so the assembly plant in Puebla, Mexico, improved inspection of the doors as vehicles rolled off the line. On April 22 VW issued a required vehicle update for all 90,000 Jettas that had been produced and offered customers free pickup of their cars, free detailing and a $50 gift certificate for future service. By mid-August 82 percent of the Jettas were fixed, prompting VW to regard the campaign as a success. Trahan, executive vice president of group quality, wouldn't disclose how much the vehicle update cost VW. As VW tries to boost U.S. sales, it has slashed prices on key models in the United States -- including the newest-generation Jetta and the redesigned 2012 Passat -- and added features aimed at U.S. consumers. It also built a factory in Chattanooga, Tenn., to produce the redesigned Passat. VW executives know that to reach a U.S. sales target of 800,000 vehicles by 2018, the brand must improve its quality in Power surveys and testing by publications such as Consumer Reports. Getting to 800,000 will be a stretch: Last year the VW brand sold 256,830 vehicles in the United States. A door of a Jetta is assembled at VW's plant in Puebla, Mexico. VW solved some quality problems with the Jetta by improving inspection of the doors as vehicles rolled off the line. David Sargent, vice president of global vehicle research for J.D. Power, says VW's consistently poor quality ratings indicate "they haven't made a huge amount of progress." "In terms of the root cause, it tells me that it [quality] hasn't been an overriding priority that it has been at some brands. Contrast them with Toyota, Honda, Hyundai, Ford or GM where they have been heavily focused on getting the fundamental quality of the vehicle right." Sargent says vehicle quality is costing VW customers. "The perception of reliability is the No. 1 reason why people choose one vehicle vs. another," he says. "Poor reliability will slow down your sales. It makes it harder to grow." Trahan, a frank-talking executive with a wry sense of humor, says the Jetta wind-noise problem is an example of how VW has been tackling U.S. quality problems with a new rigor and new procedures involving German quality and manufacturing executives. U.S. quality team members are getting input early in vehicle development, he says. "What we did is layer on processes that capture more perspective from the eyes of the customer," Trahan says. 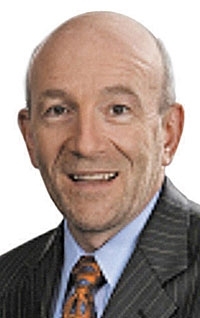 Marc Trahan's role is key to VW brand's effort to reach 800,000 U.S. sales by 2018. Thoroughly investigating field complaints is one way Hyundai has transformed its image from a laggard in quality and reliability to an industry leader in 10 years. Each morning, Hyundai's top quality executives in Korea check a database of field complaints filed the previous day by customers and dealers worldwide. VW looks at every warranty claim. When there are four or five complaints about the same problem, Trahan says his team jumps into action as it did with the Jetta wind noise. It's a 50-member team Trahan knows well, having worked with many of the members during his time at VW Group of America's former headquarters in suburban Detroit. Trahan moved back to Michigan this year after working since 2008 at VW Group of America's headquarters in Herndon, Virginia, to be close to the service and technical support staff. He started in the auto industry in 1973 as a service technician at Hungerford Imports in St. Albans, Vt., a VW, Audi and Fiat dealership. VW's Passat built in Chattanooga, Tenn., is a key vehicle in the brand's effort to increase annual U.S. sales. Trahan joined VW as a service training instructor in Chicago in 1979. He was a service training development supervisor for a decade and moved to the Audi brand where he worked as a customer relations manager, product planning manager and director of technical service and quality. He has a bachelor's degree in business administration from Northwood University. Warranty claims on VW brand vehicles have decreased substantially in the past several years -- 10 percent in the last year alone, Trahan says. He would not give specific figures. Trahan takes a glass-half-full view of VW quality, saying that the brand needs to remedy "the last little things." "It is the last 5 to 8 percent," Trahan says. "They are details like making sure the climate control panel is totally intuitive but totally functional." Some fixes are easy. Improving the Bluetooth voice quality and sorting voice recognition problems required a software update that will be made when customers bring their vehicles in for service, he says. VW's 2012 models all have improved Bluetooth. But independent metrics say VW still has work to do. The VW brand was fourth from the bottom in this year's J.D. Power Initial Quality Study. Since 1987, VW has teetered toward the bottom, except for 2009, when it was No. 15 of 27. In 2010 it fell to No. 31, of 33. Because of the changes VW has made in the past 12 months, Trahan says the results should begin to show in outside surveys and studies. "I will be very disappointed if we aren't in the top 15 in 2013. I think we can be in the top tier of the volume brands." Jonathan Browning, CEO of Volkswagen Group of America, says the quality processes are working. VW identified every problem cited in the annual J.D. Power Initial Quality Study before management got the results "and every item already had a countermeasure," Browning says. "It will make an impact going forward." Consumer Reports slammed the new-generation Jetta in the magazine's most recent comparison of mid-sized sedans. David Champion, the magazine's senior director of automobile testing, says VW was a success during its early years in the United States with cars such as the original Beetle and the first-generation Rabbit because they were "extremely reliable, and the Rabbit seemed to go forever." More recently, previous generations of VW cars had the solidity and fit and finish -- "that almost-expensive feel," Champion says. "They were close to a poor man's Audi." Consumer Reports criticized the Jetta that VW designed to appeal to U.S. buyers: "Jetta is a shadow of the agile, well-finished car it once was." But the redesigned Jetta sedan doesn't have that, he says. Consumer Reports says: "Jetta is a shadow of the agile, well-finished car it once was." The magazine criticized the handling, interior finish and the 2.5-liter five-cylinder engine. The only VW brand vehicles Consumer Reports recommends are the GTI, Golf, CC four-door sedan and Jetta TDI SportWagen -- none of the cars that VW has developed specifically for the U.S. market. Champion says VW will improve its quality only if the German parent company is committed to change: "They are probably more serious now than they have been in the past. To sell 800,000 cars by 2018, you have to do an awful lot to build the credibility of VW." "I have always felt that Germany has ignored Consumer Reports. About 68 to 70 percent of consumers defer to the magazine for new or used cars. And 100 percent of our competition uses it against us when they ask potential buyers what models they are also considering." Wade Walker, president of Walker Volkswagen in Montpelier, Vt., isn't convinced buyers pay as much attention to Power Initial Quality scores as they did 10 years ago. "The split between scores isn't that big anymore," he says. "It hasn't tremendously affected our sale -- mine and everybody's. VW sales are up tremendously. We are selling more even though we're down" in IQS. German management bought into the strategy to boost U.S. quality because it saw the improvements can be applied to European markets and key growth areas for VW such as Russia and China, Trahan says. "It comes from the top down, so that helps the company culture," he says. "They are being more supportive of our activities and efforts here." That has led to giving the U.S. market more voice and earlier involvement in corporate product decisions and development, U.S. executives say. Trahan's team recently evaluated the new-generation Golf due in 2013 that will use the new global modular transverse platform. "We as a group are going much further upstream in the design process -- five to six years," Trahan says. The scrutiny also is being applied to cars already on sale. VW's quality and product strategy teams hold quarterly meetings -- which shift to monthly in 2012 -- with Ulrich Hackenberg, head of VW brand r&d, and his team. The last meeting was July 13, and the United States came with 16 quality concerns. Approval was granted to remedy 13 problems; three more are under discussion because of costs, Trahan says. Quarterly meetings also are held with VW brand production chief Hubert Waltl and his team. Trahan says VW takes Harbour Consulting Inc., J.D. Power production experts and other consultants into the plants. There have been surprises that Trahan wouldn't detail: "We found in some factories that we are so fastidious with quality that we find things that aren't customer-relevant. In our endeavor to correct them, we have a second knock-on effect where we create an issue that did not exist before that does have customer relevance."